Lotus boss Eric Boullier says his team never had any doubts that Kimi Raikkonen would deliver in his return to Formula 1. The 2007 world champion left the sport at the end of the 2009 season to compete in the World Rally Championship, later experimenting with NASCAR as well. After his two-year absence, the Finn returned to F1 this year with Lotus and gave the team its first win of the season in the Abu Dhabi Grand Prix last weekend. According to Boullier, Raikkonen's performances this year came as no surprise to Lotus despite some scepticism elsewhere about his chances of a successful return. "This was maybe a surprise for anyone on the outside of the team that doubted him, but for everyone on the inside it was not," said Boullier. 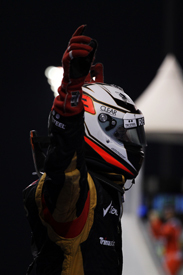 "Kimi has certainly made his mark and shown that he's back in Formula 1 and back at his best form. Having him back getting podiums and a win is great for him, great for the team and great for the fans. "Moreover, [his] 'Leave me alone, I know what I'm doing' [radio message] has already become a Formula 1 classic!" Boullier, who joined the team back in 2010, admitted that his first victory as a team boss was very emotional. "I received over four hundred messages at the track after the chequered flag! It was a pleasant surprise to see that a few of them were coming from our rival teams saying how happy they were for us. "It was nice to hear that people in the paddock thought we deserved the victory. Also, standing on the podium as team principal of the winning constructor was something really special. It was a very emotional moment. I hope we get used to it very soon." The Frenchman said his team has achieved the goals set for the season with its fourth place in the championship, but reckons it will have to push hard to reach the top three in 2013. "Fourth was obviously the target we set ourselves at the start of the year and that's where we are in the standings right now. Obviously, you can be fourth and close behind third position, or fourth and just in front of fifth. Our position relative to fifth-placed Mercedes is quite flattering. "Being fourth and fighting with teams like Ferrari and McLaren - by having a win on the board and a number of podiums - has clearly put us in a position where we could develop a stronger image of a team growing and maturing; a team on the up. "This is certainly appealing from a commercial point of view and the numbers of partners joining us this year is a proof of that. "On the other hand, fourth is still fourth, and we know how much harder we need to push in developing our resources and the company to ensure we can break into the top three next year."